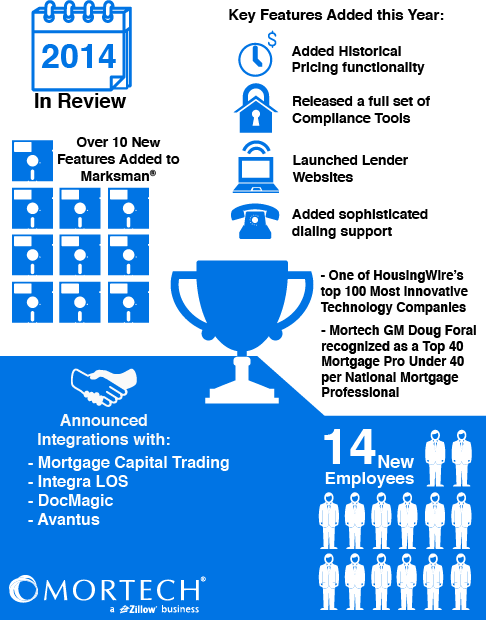 We started the year off fast, partnering with DocMagic, the leading provider of fully-compliant loan document preparation, compliance and eDelivery solutions for the mortgage industry in January. Similarly, the industry started fast in noticing us, as Mortech General Manager, Doug Foral, was named a “Top 40 Mortgage Professional Under 40” in National Mortgage Professional’s fifth annual edition of the feature listing. We also added new compliance features to our real-time CFPB compliance management suite, making Marksman one of the easiest and most effective compliance solutions available to lenders. Before we knew it, spring sprang, and with it came another new addition to Marksman, this time in the form of LPMI products, which expanded the mortgage pricing engine's ability to support both LPMI and borrower-paid MI. We also found ourselves in the spotlight of the industry yet again, as HousingWire named us one of the “100 most innovative technology companies” in the US housing economy. Moving on to summer, we announced an integration with INTEGRA Software Systems loan origination system (LOS) allowing users of Mortech’s PPE and INTEGRA’s LOS to be able to access and use both programs to further enhance their online loan capabilities. We weren’t done however, also announcing integration two months later with Avantus, a leading provider of customized mortgage credit reports, mortgage-related services and technology solutions. This direct integration allows Mortech customers to pull credit through Avantus without leaving Marksman, providing a simple, convenient credit solution for lenders. Finally, we rounded out the summer by announcing our new dialer support to Marksman. Through the use of this new feature, lenders can improve their speed to contact and borrower experience, ensuring that their lenders get the best results - leaving them happier than ever. The year may have begun to wind down in the fall, but we didn’t; first we launched lender websites, which allows lenders to quickly and affordably create a custom WordPress–powered website for their personal brand and business. This wasn’t all though, as later in the fall we announced the addition of Historical Pricing functionality to our Secondary Marketing solutions, making it easier than ever for lenders to re-price loans by severely cutting down the time it takes for each locked-in loan. Finally, at the beginning of December, we announced our integration with Mortgage Capital Trading and their award-winning real-time trading and best-execution product, making it possible for lenders to manage hedging, trading, and pipeline risk all in one place. This last year was a great one for us here at Mortech, but while we’ve put in a lot of hard work and announced several different integrations and product releases, we know we’re looking forward to much more to come in 2015. After all, our goal is to provide the best in mortgage technology and secondary desk tools to our customers, and that’s something that we will continue to strive toward, into 2015 and beyond.